Picking raspberries is a yearly tradition in our family. 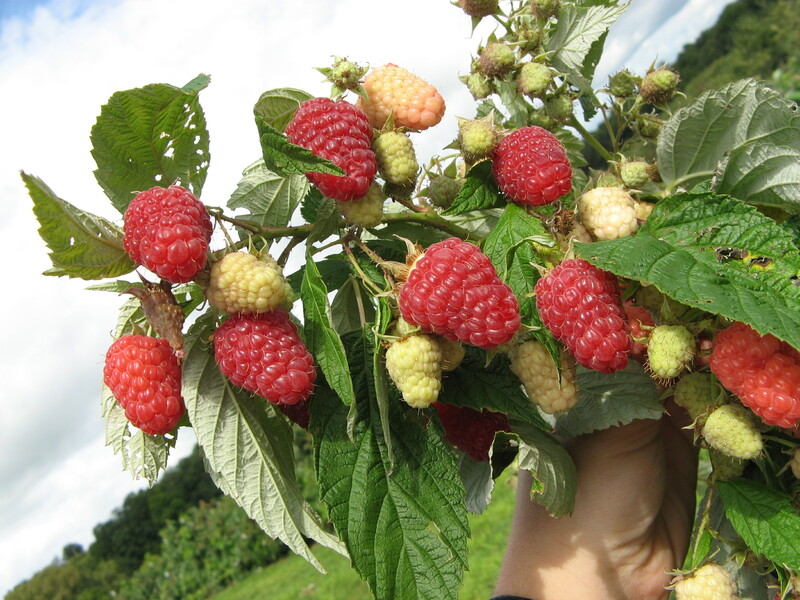 We love to go out into the country and hide among the raspberry canes, popping berries into our mouths as we pick buckets full to freeze for the winter. We freeze our raspberries on cookie sheets and then, once frozen, transfer them to freezer bags. They do lose some of their sweetness once they are frozen, but we still enjoy them in pies, crisps, muffins, and smoothies throughout the year. I decided to try a savory dish with raspberries and found this recipe for grilled raspberry chicken. Unfortunately, that evening my grill decided not to start, so we had to bake the chicken instead. It still tasted terrific, the mustard and raspberry making a winning combination with the chicken. However, I'm sure it would be even better grilled. As the recipe suggested, I topped the chicken with a few frozen (but thawed) raspberries. 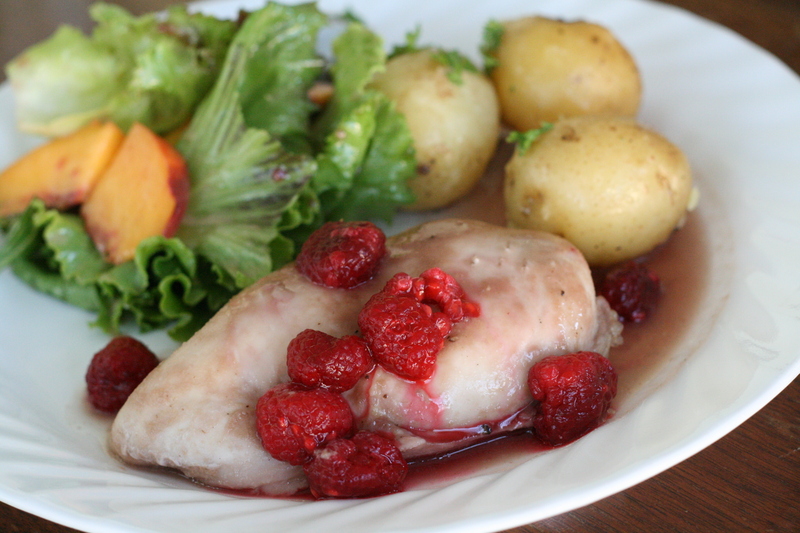 I think I preferred the chicken on its own with the cooking juices/sauce rather than with the whole raspberries. 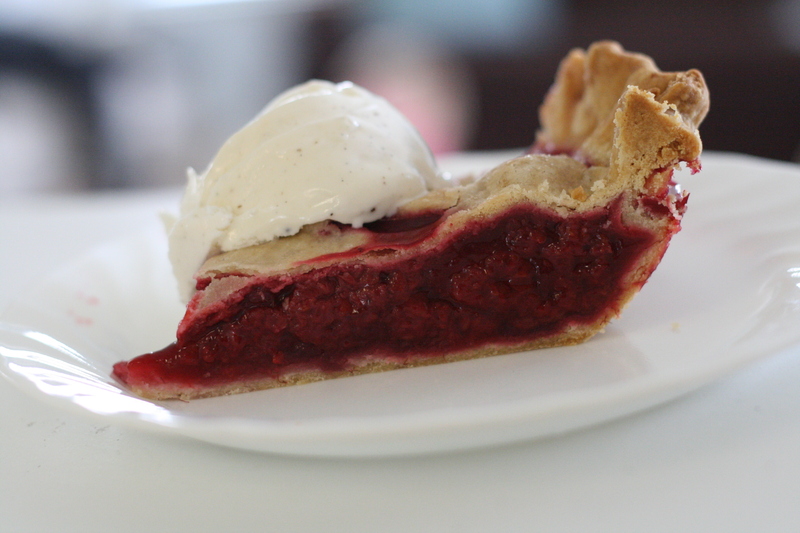 I've also included a recipe for raspberry pie because fruit pies are my very favorite. Heat gas or charcoal grill in. In a small bowl, mix jam and mustard. Carefully brush grill rack with canola oil or vegetable oil. Place chicken on grill over medium heat. Cover grill; cook 20-25 minutes, brushing occasionally with jam mixture and turning once, until juices in chicken run clear. Discard remaining jam mixture. Note: You can also bake the chicken at 350 for 40-50 minutes with the glaze on top of the chicken. Mix together cornstarch and sugar. Add lemon juice and sugar mixture to raspberries. Pour into a pastry-lined pie plate and top with pastry crust that has vent holes cut into it. Bake at 375F for 60-90 minutes (timing depends on fresh or frozen berries) until center of pie is bubbling. Allow to cool (pie will thicken as it cools). Other ideas for raspberries include using them to top a pavlova, serving them with an easy pannacotta, and stirring them into gluten-free muffins.